Precision-machined compliant pins and receptacles have been a leading product of Mill-Max for over 20 years. Originally designed for solderless-press-fit into printed circuit boards, these pins have found a new application as the elements of a card-edge to card-edge connector. 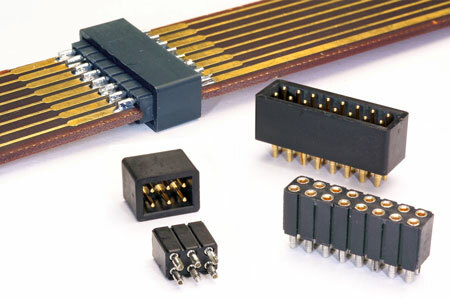 When the pins are assembled into a dual row header or socket having a .100" (2,54mm) grid, the compliant features of the pins make the header and socket a perfect press-fit onto the edge of a .062" (1,57mm) thick printed circuit board. This holds them in position prior to soldering (manual soldering or reflow with paste). In addition, the header half of the connector pair is shrouded. This protects the pins from mechanical damage and also provides a means of alignment when the two printed circuit boards are plugged together.